Marble – the choice of Kings, Queens and Emperors alike; ours are chosen from the exquisite Ionic Stone stock, polished, honed, tumbled and brushed from Tiles R Us. One word can sum up these stunning tiles - stunning! The white background colour of this marble tile helps set the tone for any room whether you are using them on the floor or walls, hard wearing, versatile and durable, they can be used just about anywhere. The tumbled finish gives them a beautiful aged appearance adding that 'wow' factor to your new bathroom, lounge, kitchen, absolutely anywhere you could lay first class marble tiles!. Tumbled tiles add great depth to any flooring, they provide a natural pitted surface that has broken, rounded edges and corners. It is the process by which stone is tumbled or vibrated with smaller abrasives to produce an aged appearance. 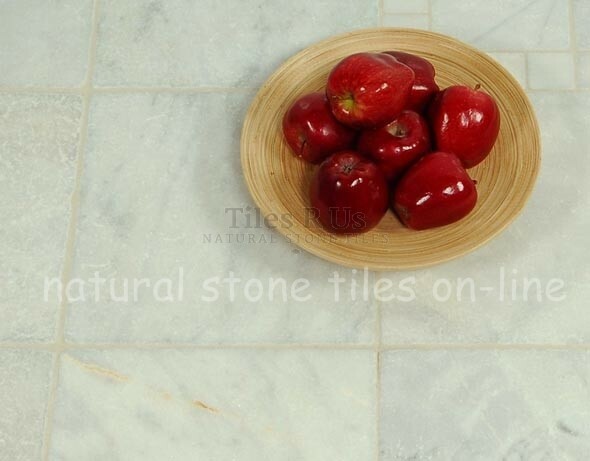 This quality of tile has natural minimal variations in colour without veins and other patterns are generally absent. The result is a marble tiled area that feels rustic and relaxed yet sumptuous at the same time.